Albany isn’t a place stuck in the past, but rather a city that honors its history while cultivating contemporary events, exhibits and active transportation. It’s easier than ever to jump on a bus, bike, train, or trolley to climb, paddle, hike, and camp. You don’t have to purchase a badge to get in on some of the fun, including inspiring breakfast talks, live podcast recordings and late-night parties. 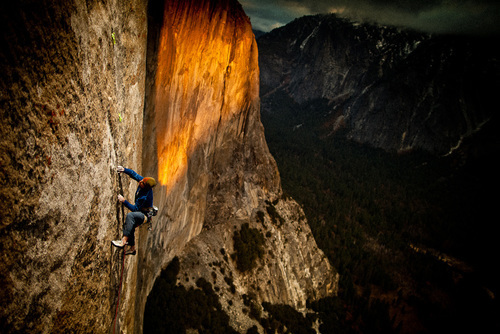 These women are changing the world of adventure film, outdoor sports and beyond. Barbara Hillary became the first African-American woman to reach the North and South Poles at age 79. She’s living proof that adventure is for everyone, regardless of age, race, or financial means. Whether you’re looking for an avalanche safety course or a guided hut trip, these clinics and trips are the best in North America. The majority of people traveling to National Parks do so by personal vehicle. While increased interest in National Parks has led to more people exploring the outdoors, the beauty and safety of the parks are challenged by the added vehicles. Julieta Gismondi and Lou Anne Harris started their epic journey from the middle of New York City by loading up their Stand Up Paddleboards at Pier 84 in Midtown Manhattan. It can seem tough to balance your adventurous spirit with city living, but these micro adventures all exist within the city limits to bring you easy access to climbing, hiking, snowshoeing and cross country skiing. The rules of the challenge were straightforward: each day for 30 consecutive days, I must find and participate in a new outdoor adventure from yoga to kayaking to biking. When I head to a new city I always commit part of my time to exploring its natural areas. Hiking, biking, and boating abroad give me a peek into the global lifestyle options of others who, like me, live in urban centers and want to feed their passion for the outdoors. I arrived in Los Angeles two days after my visit to San Francisco and decided, yet again that a hike was needed to fully introduce myself to the city. Every time I visit a new city, I first look to outdoor recreation as my way to explore. My first day in Vienna was spent on a bike, Capetown on a long run, and most recently – San Francisco in hiking boots. The ever-growing SheJumps community in New York City found snow together on the snowy slopes of Vermont. This February, I was invited to spend a day with the Ladies Ski Club at Sugarbush, one of New England’s largest ski resorts located in Vermont’s Mad River Valley. It was almost exactly one year ago that I signed up for the Weekend Intensive program at the Yiddish Farm in Goshen New York. I’d been to Deer Valley once as I child. I remembered nothing of the skiing and only a little of the Utah resort–mainly a souvenir shop where we purchased an extremely large ceramic mug that my brother and I would fight over for years. The initial plan was to leave New York on Saturday morning to go skiing in Vermont for International Women’s Ski Day (IWSD). “What is your North Pole?” explorer Barbara Hillary asks a crowd of New York outdoor enthusiasts a few weeks ago. This week the internet is going crazy about birds. The National Audubon Society released a 7-year study on climate change’s effects on bird population and people are listening. As a city-dweller, accessing the great out­doors isn’t impo­ssi­ble; you just need a few good hacks. A few weeks ago I spoke at the second annual NY Trav Fest about how to travel within the city limits. Turn on your computer & reconnect with nature. I moved out to Utah for the snow – and good lord there was a lot of it. I didn’t mean to become a social entrepreneur. It happened so fast and before I knew it my tweets had a funny new hashtag. The hardest parts of adventuring are not the 16-miles of hard hiking or the bug bites from camping out. The hardest part is the return to routine. While Bryson tells the story as a personal account of his hiking, it is interlaced with the deep history of the trail as well as a critique of America’s misuse of natural resources. Consumers won’t just be scouting gifts for friends and family come Black Friday. ESPN Deportes launched a new campaign for its Dominican winter baseball season. 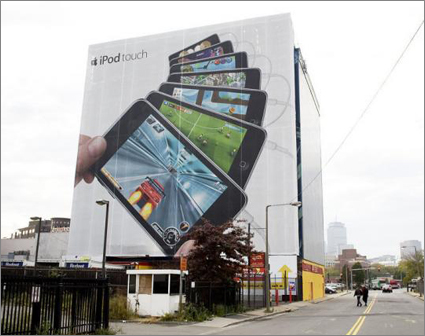 A gargantuan iPod Touch billboard disappeared from its scaffolding in Boston this week. Subway has added Seattle’s Best to its breakfast menu. Incentive Magazine Maritz hopes that cash and non-cash rewards can get along. 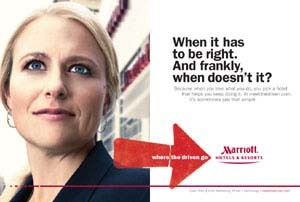 Marriott is showcasing its colorful clientele in a new advertising campaign. Instead of striving for record-breaking DVD sales, Twentieth Century Fox decided it would be more cost-efficient to break a record by building the tallest ice sculpture. Volkswagen is promoting its 2010 GTI vehicle by putting consumers behind the wheel of a new iPhone application. The “éne•bé•a” campaign will highlight the NBA’s Latino players. In time for Halloween, the Jelly Belly Candy Company has launched a line of gift candies that will both trick and treat. Successful Meetings Hyatt thinks it’s time to return to face-to-face social interaction. Finally, there’s hope for those living in dark, damp, technology-deprived caves. According to a survey by job search service Accountemps of 455 part-time or full-time employees, the amount of time staffers plan to shop online while on the clock decreased to an average of 1.9 hours a week. Person-to-Person Lending: Is Financial Democracy a Click Away? Created by Nigerians from “various reputed” Nigerian banks, Olive is now in the process of hiring an extended network of staff to operate the institution. The Nigerian government cut its Small and Medium Enterprises Equity Investment Scheme (SMEEIS) due to a lack of success and underutilization. The International Finance Corporation (IFC) recently made a USD 15.6 million equity investment in financial conglomerate Grupo Mundial Tenedora S.A. IFC now has a 9.9 percent stake in the group.